Located at the end of a peaceful little cul-de-sac in the South End, Breezy Point is an excellent choice for anyone looking for a waterfront condo on Marco Island. With deeded boat docks, wrap-around views of converging waterways, a great amenity package and a picturesque neighborhood, Breezy Point condos on Marco Island definitely check all the boxes. Pets: 1 - 20 lbs. At $452, Breezy Point's maintenance fee is quite reasonable. It covers the usual stuff like master insurance, cable TV, lawn maintenance, landscaping, manager, pest control, trash removal and water & sewer. Compare all maintenance fee on our Waterfront Condo Comparison Guide. Pets are allowed at Breezy Point. If you have one pet, that weighs less than 20 lbs., you're good. The minimum rental period in Breezy Point is 30 days. This is typical of condos on Marco Island. There are two different floor plans in Breezy Point. Since one is just the reverse of the other, you could say there is only one floor plan available here. Click here to see all Breezy Point floor plans. 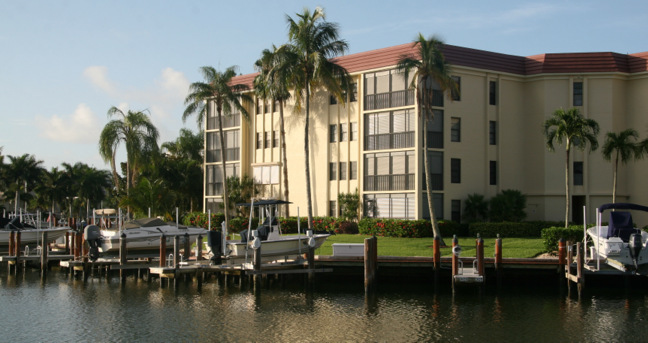 Located at 880 Huron Court, and built in 1977, Breezy Point Marco Island Condos consists of two three-story buildings and a social club room. These are constructed around the pool and spa area, which lies in the center of the property. This clever architectural plan offers much more privacy for its guests who adore sunbathing. The utilities and maintenance of Breezy Point meet and exceed the requirements of modern standards. Each of the 32 units has spacious but cozy 1,500 square feet. The general floor plan consists of two bedrooms, two full bathrooms, laundry room, kitchen, living/dining room, and private sundeck. Pets are allowed less than 20 pounds for owners only. The property also supplies a lifted boat dock to each resident. Breezy Point is only 0.3 miles away from the white-sands of South Beach where you can enjoy shelling, swimming, sunbathing, or long strolls. Just north of South Beach is Sunset Grill that has spectacular ocean views with dining in, or out of doors.